Our ranges of chairs and armchairs encompass a variety of styles. From classical Louis XV timeless shapes to cutting edge contemporary award-winning designs, you will be amazed. Danish designer bar stool made in stainless steel and woven leather. 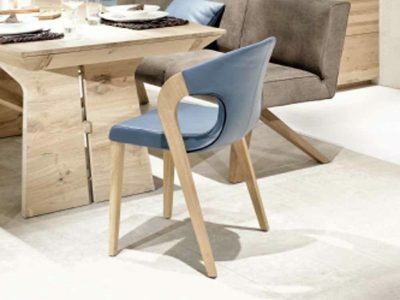 Elegant chair by German designer Martin Ballendat available in oak or in walnut. This chair is an excellent example of minimalist contemporary design and Austrian craftsmanship. The choice of materials stands for highest quality to satisfy the demands of our most discerning customers. The two kinds of solid wood (oak or walnut) can be combined with different materials for the seating. Your options for a comfortable upholstery are the highest-quality and finest sheeps’ wool “Loden” (100% Merino wool), “Vintage” (100% polyester) or real napa leather. 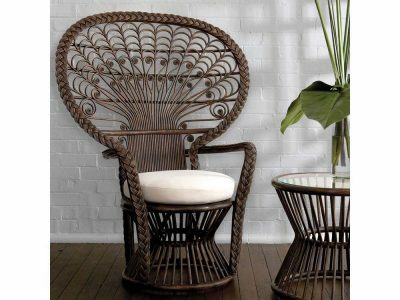 The triangle form makes this luxurious chair a stunning accessory in your apartment. We will supply a free maintenance kit including a 250 ml bottle of oil and a polishing cloth so that your high-end furniture gleams all year round. The German designer Martin Ballendat created this chair in clean and elegant lines to make your home a smart and stylish living space. The different types of wood available are rustic wild oak and walnut. The wood is an oiled surface that is breathable and that will improve your indoor climate. 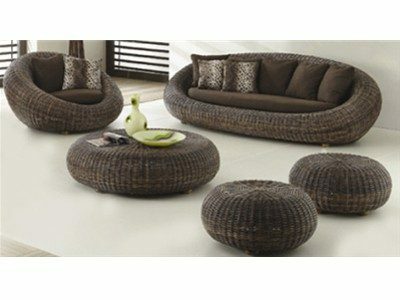 The used materials are luxurious and extravagant, simultaneously they guarantee comfort. For the seating of this outstanding chair you can choose between the highest-quality Merino wool “Loden”, the polyester material “Vintage” or real napa leather. This chair combines minimalism, exclusiveness and excellent Austrian craftsmanship in one piece. The sleek and perfectly crafted Quadro chair comes with either a metal base or with exquisitely shaped wooden legs. The perfect combination of Scandinavian design with audacious components (copper, metal, rattan, etc.). This bar stool can be ordered in plated copper which really stunning and suitable for the most trendiest decors. Velichko Velikov, Bulgarian designer residing in London, UK. The ELAXA chair is made from bentwood and metallic joints, seat and base, the wooden parts are contemporary take on the classic Thonet bentwood chair designs. The ELAXA Chair took the rules developed by classic Prague and Tivoli chairs and really mixed things up with layers of bentwood and the use of a reflective metal. It is meant to be a connection between the old and the contemporary furniture, as a flavour of the old times in the today’s interiors. Despite their modern appearance, the bentwood ELAXA Chairs could equally be a fantastic counterpart to a heavy, bold dining arrangement or a bright and approachable kitchenette. The Nervure dining chair reflects organic design at its best as its intricate lines in solid aluminum represent Quasar Khanh’s vision of a leaf’s veins. The smooth and sensual surface of its aluminum frame as well as the intricate details of its organic lines will leave a long lasting impression on your guests. The perfect fusion between organic design, high end materials and functionality, the Nervure chairs, armchairs and tables compose a stunning range of furniture. For the most discerning clients, each item within this collection is a true masterpiece. 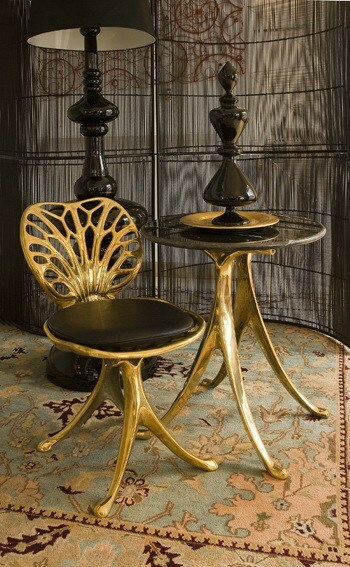 For those who only settle for the highest level of luxury, the Nervure chair can also be ordered in solid bronze. The bronze Nervure dining chair reflects a luxurious version of organic as its intricate lines in cast molten bronze represent Quasar Khanh's vision of a leaf's veins. The smooth and captivating surface of its bronze frame as well as the intricate details of its organic lines will leave a long lasting impression on your guests. The perfect fusion between organic design, high end materials and functionality, the nervure chairs, armchairs and tables compose a stunning range of furniture in one of the most luxurious materials available, bronze. For the most discerning clients, each item within this collection is a true masterpiece. The Nervure armchair is the most eloquent expression of organic design at its best. Its intricate lines cast out in solid aluminum represent Quasar Khanh's vision of a leaf's veins. Living room set in Water Hyacinth. Set composed of one 2 seater sofa, one armchair, two stools and one table with glass top. Standing alone or completing the perfect setting next to a table, chairs and armchairs can be the definite touch to achieving a coherent and balanced ensemble. Choose amongst the most stunning designs and demand the most exquisite craftsmanship of our collections. Our chairs and armchairs are created by international design award-winning artists and produced by the best furniture factories. Demand perfection and we will deliver quality and aesthetics that will highlight just how beautiful and important a chair or armchair can be in completing the ambiance of your home. Our chairs and armchairs are made in a variety of materials, ranging from walnut or oak wood to fabric and leather upholstery. The factories that produce our furniture lines are well-known for their exquisite attention to detail and the high level of quality of their products. Our factories are located in Austria, France, Italy and Spain.